FCKEditor, the rich text editor feature in MoinMoin wiki has been removed from the Debian/Ubuntu distributions from a decision the maintainer(s) made after notification of a security issue of enabling it. Obviously I wasn't the only person who got annoyed by its removal, given that the rich text editing feature has been the first place why many, like I, have used the wiki altogether. So even the 'free' as in 'freedom' in software turns out to be not so free anyway - given that I had no freedom in weighing my own pros and the cons of dealing with the potential security problem. For me, the answer is clear as day - the wiki is only used in a secured local area network and has no editing rights, not even reading rights to anybody outside the intranet - so why should anybody dictate that I can't use FCKEditor with MoinMoin? (No) thanks to them, this post wouldn't have existed if not for the shortsightedness in destroying the appeal of what otherwise would be an attractive software package. For all that FOSS is worth, it's main Achilles heel is certainly the lack of attention to the needs of end customers. That's why FOSS companies have to make their money out of service - because there is none! The workaround to using Debian/Ubuntu's version of MoinMoin is downloading the current version from the website and install it. Converting it to use your existing settings should be a relatively painless task. Using /usr/local will separate the Debian/Ubuntu copy from your self installed copy. You can then proceed on to installing MoinMoin using the same instructions from Ubuntu 7.04 - the instructions are still valid, but the thing that you have to watch out is to remember to replace all references of /usr/share/ with /usr/local/share. This will make the wiki start reading from the /etc/moin directory like your Debian/Ubuntu package does. 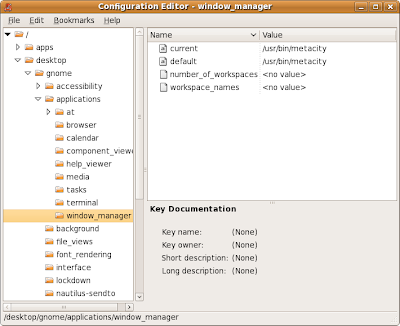 # The GUI WYSISYG editor is not installed with Debian. Once the changes are made, restart apache, and FCKEditor should be reenabled again. I'm using a Sapphire's ATI Radeon HD 3650 card, which may help you if you are using the same thing and want to set up a dual-head display properly. From my experiences, I found that Ubuntu versions 7.10, 8.04 and 8.10 will get the card to work straight out of the box, but I had no luck to get it to work for dual displays perfectly except for version 8.10 (You'll still need some modifications to xorg though, see below). For the two older version 7.10 and 8.04, the closest thing that I have come to making it work on the older versions is by downloading and installing ATI's driver straight from their support site. With the older versions, both the xserver-xorg-fglrx (did not work - black screen) and the xserver-xorg-fglrx-envy (defers to the Mesa driver, making it horridly slow) packages weren't the most fruitful experiences when I tried installing them, so avoid unless you're keen on experimenting. I'll recommend not to use this option if you have planning to upgrade to Ubuntu 8.10. There are a few quirks with the installer version that will not work well with your window manager if you wanted a rotated screen (See later section). The steps are straightforward in this case: just execute the downloaded installer and follow the instructions. It's important to note the that the uninstaller is located at /usr/share/ati/fglrx-uninstall.sh, which may become necessary to do to prevent conflicting installations if you decided to apt-get from Ubuntu's repository later. These steps are probably not necessary if you've installed Ubuntu 8.10 fresh, but may be essential if you got here through an upgrade path like I did. The main things you want to apt-get are: xorg-driver-fglrx, jockey-common, jockey-gtk. As a non-dependent package, jockey-common is surprisingly crucial to getting your setup to work, as it contains working versions of amdpcsdb and various important files in /etc/ati. Once you the packages installed, if you are running gnome, go to 'System -> Administration -> Hardware Drivers' and you should see the ATI Driver available for installation. Click on 'Activate' to download the driver and install. It may take a while before the installation completes. Add the line in red into your xorg.conf if it isn't present. Here's an example xorg.conf that may help. Once you are done with the changes, restart your machine. You can also run fgl_glxgears to verify that the card is running correctly visually. The dual-head display set up does not work well with the compositing manager - this is troublesome for Gnome because the default manager is Compiz. You'll have to pass the eye-candy and rely Metacity instead. If you don't, your reconfigured X server either conks out with a backtrace failing on some deprecated calls, or you're greeted with just a wallpaper background or a black screen. To get access to the settings, you'll need gconf-editor which is an X application, so you should change this setting before you try restarting X in dual-head mode. Next is to make changes in your xorg.conf file. While ATI provided the default tools like 'aticonfig' and ATI's Catalyst Control Centre ('amdcccle'), I'll recommend you avoid them for now (see Troubleshooting for why). Identifier    "ATI Radeon HD 3650 "
Device                "ATI Radeon HD 3650 "
Device               "ATI Radeon HD 3650 "
Screen          "Screen 1" RightOf "Screen 0"
The full xorg.conf file can be found here. Make the relevant changes, keep your fingers crossed, and restart your computer. Restart X or your computer after you made the changes. While the ATI installer versions works without a hitch on older versions of Ubuntu, rotation is the only case it doesn't work right. For your window manager to detect it's dimensions properly, you'll have to install Ubuntu's version of fglrx, which somehow takes care of the rotation properly compared to the ATI installer version. Rotation also will not work if you are running in Xinerama configuration - you'll end up with areas on your workspace not being accessible by your mouse. Replace DFP2 with whatever screen xrandr reports you have. 1) There are a few times I had my run-ins with the utility tools ATI provides. Firstly with 'aticonfig'. While it proves useful sometimes, at others, it screws up your xorg.conf configurations. What I'll recommend is that you play around with aticonfig, and copy the relevant parts it generated into your own xorg.conf file, instead of relying on it blindly. 2) The other tool, ATI's Catalyst Control Centre ' - amdcccle', is just pure evil IMHO. The ATI drivers install an important file called '/etc/ati/amdpcsdb', which it loads independently from xorg.conf. If you're finding that X isn't working anymore even with an xorg.conf file you know to have worked previously, it's most likely that the amdpcsdb has been corrupted, which I find that happening from tinkering around with amdcccle, which is probably the biggest time wasted in trying to hunt down spurious problems. Do make backups of the original file before you do that, I'm not responsible for any loss or damage it would cause! # always true and this configuration setting is ignored. Growing up in a world where MS-DOS was the first operating system I've ever used certainly leaves me rather brain-damaged when it comes to the 3-finger salute of 'Ctrl-Alt-Del'. That key combination literally is the 'One Keystroke That Rules Them All' - more or less, it's the last thing that will probably still work in the face of a catastrophic computer failure. Obviously, I never did wean off from my un-elite MS heritage, so it should come as no surprise that I sometimes still use 'Ctrl-Alt-Del' to solve my problems in Linux. Still, it's nice to know that Linux on the whole has always been accommodating enough to include that magic keystroke to satisfy the likes of people like me - most distributions secretly sneak in a line in /etc/inittab (or /etc/event.d for Ubuntu's Upstart) to make it reboot should I fancy myself into fondling those keys when my urge arises, although I must say I have less urges to do so these days ever since I've migrated to Linux, so thanks for asking! Shame to say, I've only recently discovered the equivalent of 'Ctrl-Alt-Del' in the Linux world after using it for 8 years! "Reboot System Even If Utterly Borked"
With luck, that will try to kill all processes gracefully, sync all data to your drives, unmount them, and reboot your system. There's more to the Magic Sysreq keys than I have let on, and more details can be found here. There are a few other neat tricks with the Sysreq keys, like killing off errant applications that's chewing off too much of your system memory with 'Alt-PrintScreen' + r-f.
A pity that I've only learnt it after such a long while, for it would have been really helpful when I was tearing my hair off a while ago when Rubygems was chewing up all my free memory and thrashing my harddisk from all that silly swapping. Bloody linux has done it again, borking up my machine during an upgrade cycle. That's always why I'm hesitant on upgrading unless there is no choice. I'll leave the FOSS purists to argue about the concept of 'free' in whatever way they like, but I've always been mindful that there is a hidden cost involved in using Open Source software - you're paying it with your time as a guinea pig for the developers to solve the problems you've encountered. One way to mitigate that cost is by not using the most cutting edge versions of software - in that way, you're relatively safe from any initial teething issues that still needs to be fixed. But the bad news is, stable/working probably equals to 5 years or more in the FOSS world, and computer hardware moves faster than that. Given the fast turnover of computer peripherals, no sensible shop will stock 5 year old hardwares to sell it to you, and hence my problems started when I added a new ATI Radeon card to the system. The last known working kernel for the Vostro had been 2.6.22-14-generic, which I had found out a long time ago when I had 'apt-getted' a 2.6.22-16-generic kernel. The obvious quick-fix then was to be make GRUB boot my older kernel, to which I left it at that. But given that I had installed a new card and needed to install ATI's newest driver, the driver installer, in cahoots with dkms, decided that I wanted a 2.6.22-16-generic kernel module, which obviously screws up X, and hangs my machine whenever the xserver tries to start. So I'm left with the situation that either the kernel will hang, or X will. Greeeeat. I don't know what exactly the kernel flag does, but I suppose the SATA controller wouldn't jive with the kernel and needed a jolt of forcible of polling from the kernel for it to work. In the deep, dark dungeons where a lone man is working in near darkness, only to be briefly illuminated by random arcs of lightning bolts and the cackle of electricity zipping through the air. Frankenstein's monster: Is it, Solaris? Dr. Frankenstein: No, Ubuntu my friend, Ubuntu! Last night, the BBC Met Service reported of snow in several areas in the UK from the Arctic blast. Seems like the Emerald Isle is not immune from it too, look what's outside my window this morning - frost! Who is he? Just some guy who brought us BSD, NFS, the UltraSPARC and parts of Java. To the uninitiated, these terminologies probably don't mean much to you, possibly other than Java (Yes, they are the guys who trademarked the name of an island in Indonesia because they couldn't screw around the laws of their own country to name it after a tree). Besides being the creator of these obscured things, his important contribution to Computer Science to me, is vi, the precursor to the vim editor that I use almost on a daily basis. Vi is a very old piece of software that was created in 1976. Even as a text editor older than I am, it one of the most remarkable software that I've used. Not that it is the most earth shattering piece of software, but that some people like to argue that Google Earth is more rightly so, yeah right, you laymen. Pfffffffft. While I find vi archaic enough, vi was born out of Joy's frustrations with another archaic editor called 'ed'. Just to highlight how l33t these guys are, they had to name everything in two archaic letters, just like the 'holy trinity' of Unix commands 'ls', 'cp' and 'mv'. More talented than the other Bill (That billg@microsoft.com, who was said to have written BASIC over the course of one weekend), Joy known for writing vi over the course of a single weekend too, as well as writing the entire TCP/IP stack of Berkeley Unix by himself.